Sometimes we can boil down good parenting to just a few things. 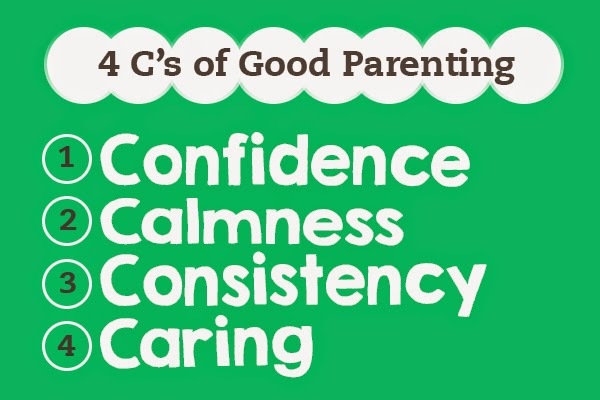 Like, in this case, with the 4 C�s of Good Parenting. 1. Confidence. A good mom is a confident mom in her ability to �be the mom.� When you parent your children, you want them to feel secure in your abilities to make good decisions for them. It�s not that you need to appear perfect, but you do want to take charge so your children know they can depend on you. Plus, all moms know how children push back and test our limits. If you stand firm, confidently, you help your children learn how to live within boundaries. 2. Calmness. When you lose it, you pretty much leave the land of �good parenting.� When you parent from a place of anger, lost temper, or constant screaming, you lose your effectiveness. When you stay calm, you can think more clearly and make good decisions. And when you�re calm, your children are more likely to stay calm too. 3. Consistency. A wishy-washy mom isn�t helping herself or her children. Sure, you need to adjust once in a while, but you should stick to your well thought out plans when it comes to discipline and other expectations you have for your children. Of course, consistency doesn�t mean you treat all of your children the same. But, you are consistent in how you deal with each child individually. 4. Caring. Your kids have to know you care. That goes beyond loving your children. It means that you take an active interest in them as people. A good mom will show it by listening to her children, treating them kindly, and taking the time to do the little things that go further than just meeting their basic needs.